Whether you need to ship a motorcycle overseas via container service, ro-ro or airfreight, the first step is to research licensed, bonded and experienced international motorcycle shipping companies. Schumacher Cargo Logistics ships over 5,000 motorbikes internationally per year to over 60 countries across the globe. Where do you need to transport your bike? Some of our highest volume destinations include Europe, the Pacific, Middle East and Southeast Asia. With our consolidation services, you’ll also get some of the best rates in the business! It all starts with our customized pick up services that take into account your location, budget and overall requirements, all of which help determine the cost to ship a motorcycle from the USA. The first step to any international shipment is receiving the vehicle(s), which you can deliver yourself or take advantage of our nationwide pickup service. Upon entry of bikes into one of our 5 USA motorcycle shipping port locations, a full and complete dock receipt and inspection report is issued, pictures are taken and you’ll be emailed copies for your records. Did you know that faulty equipment and improper securing are the leading cause of damage during transit? Securing bikes is one of the most important steps performed by international motorcycle shippers, which is why motorcycles are only handled by our professionally trained staff. 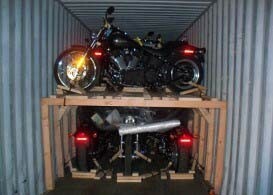 Furthermore, when shipping a motorcycle overseas via container, all of our loading is done in house and not by a Broker! We only use certified wood and within the containers, the motorcycles are strapped down and secured using the “block and brace” method. Depending on how many bikes are being shipped and the size of the container, they may also be double stacked, resulting in lower international motorcycle shipping rates. Besides ocean transport, our air freight division offers services for both importing and exporting motorcycles from the USA. When using either a container or roll on roll off service, most carriers make it optional to have your motorcycle crated. However, when using any air freight service all bikes must be crated using certified heat treated and stamped wood. There are additional documents that are needed with the most important being the SLI form. Also, the cost of shipping motorcycles with air freight is based on cubic volume due to the demand for space and weight limits on most airliners. If you need expedited transport for your Harley Davidson or ninja, air freight is an option and works well with short time frames but the tradeoff to this is a higher overall cost. For instance, ocean freight in a container for a standard size bike to a main destination like the UK or Australia might cost you $650 from the west coast but that same shipment for a chopper would be more and will vary based on the length. As mentioned, ocean freight is only one part of the equation. You also need to consider domestic transport, whether you are shipping via container, RoRo or air freight, and the destination charges. Even those shipping a motorcycle to Europe, will find that different countries within the EU have slightly different import fees and requirements. With our motorcycle transport safety records exceeding the industry’s standards, you’ll have peace of mind knowing that your bike is in safe hands. Whether you are shipping a Harley Davidson, ATV, quad or dirt bike, you will be comfortable knowing that our motorcycle transport company will take care of all aspects of your shipment. If you would like to see first hand how racing motorcycles or vintage bikes are crated, loaded or secured, visit our gallery section.